Lock in a great price for Barefoot Manta – rated 9 by recent guests! Amazing experience! The staff were really nice and so talented, playing music almost every night. Such a beautiful island, both above and under water. Room was simple but clean and the shared toilets and showers were great. We didn't do many activities but there was a lot to choose from if relaxing on the beach gets boring after a while. The accommodation is excellent and the staff very nice. The location is like a little paradise. Juan at the activities shack went above and beyond. Barefoot Manta had the best staff who were all so friendly and went above and beyond to look after us and make sure we had a good time. The food was delicious, and there was a daily timetable of activities that you could take part in. Barefoot manta had beautiful beaches and the best snorkeling, could not recommend enough! Amazing location, very friendly staff, great food. I totally recommend it! The snorkeling off of the beaches was fantastic, as well as the snorkeling trip. Great service by Joey in the restaurant, Api at the bar, and Sami with snorkeling/scuba. Only way to get here is ferry or seaplane from the main island - staff helped plan transfer on the ferry on the way to the island - wish they would have helped plan it on the way back as well. We had a beachfront bungalow (tent cabin) that had a wonderful sea view and was only steps from the sea on the sunset side. It was also close to the dining room and front desk. Very handy. 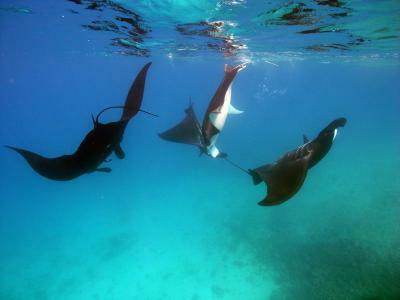 Manta has fine snorkeling in coral gardens with plenty of fish on the sunrise beach side, and mantas in the channel during their season to feed. The meals were excellent, the staff very good and so helpful. We enjoyed the good music that went on all during the day. We really enjoyed the Yasawa Flyer ferry ride out to the island. Scenic and comfortable way to travel. Nice location, friendly staff, coral reef in front of you, good food, snorkel gear for free. Highly recommended! 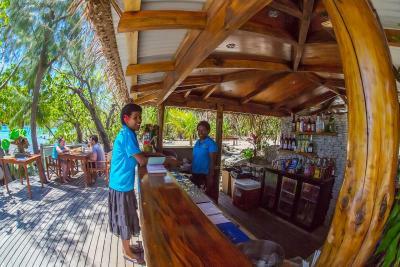 The staff at Barefoot Manta were super friendly and helpful, especially Saki and Lessy. 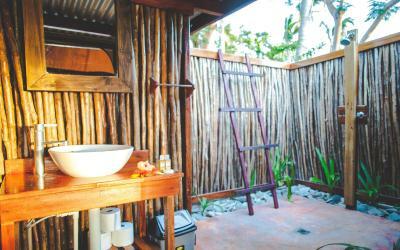 The simple but charming eco-lodges blended in to the natural beauty of the island's surroundings. It felt like I had discovered a little piece of heaven. 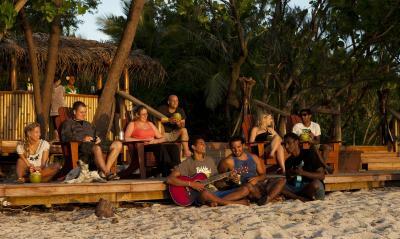 I only spent one night on the island but by the time I left I felt like I was part of the family. Located in the secluded Yasawa Islands, the eco-friendly Barefoot Manta Resort is ideally located for swimming, diving and snorkeling. 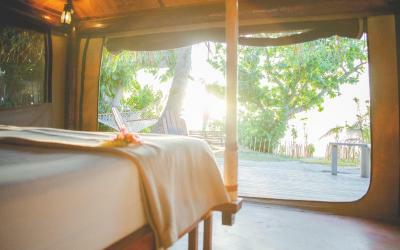 All bungalows are set on the beach, and guests can swim, dove and snorkel right from the shore. Guests can enjoy a number of recreational activities on site or nearby, including volleyball, kayaking and hiking. Meals are prepared by the onsite kitchen, which serves Pacific Island-style dishes, using locally sourced produce as well as other cuisine. Lovely sea and beach views are offered from all bungalows. 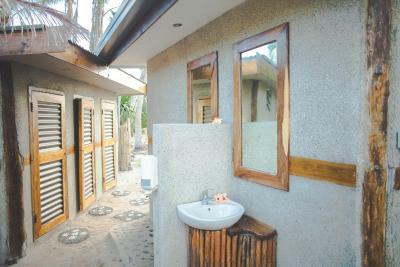 Some bungalows feature a private bathroom, with hot water facilities only available in selected rooms. The property is also home to a manta ray research station. Diving courses and conservation talks can be arranged upon prior request. Accessible by boat or seaplane only, Barefoot Manta Island is a 30-minute seaplane ride from Nadi or the Yasawa Flier departs from Denarau Marina daily at 08:30 taking approximately 3 hours and a stunning cruise through the Mamancua and Yasawa Islands. This property also has one of the top-rated locations in Naukacuvu Island! Guests are happier about it compared to other properties in the area. When would you like to stay at Barefoot Manta? 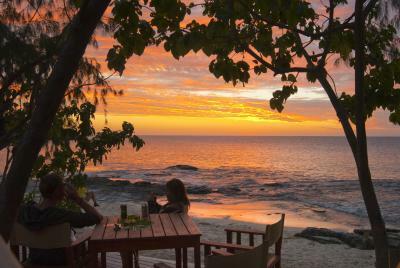 Located alongside the beach, this older-style traditional beach bure offers either sunrise or sunset views. Includes access to shared bathroom facilities. Please note that the price is based on 2 guests. There is no capacity for additional guests. A mandatory resort package, including breakfast, lunch and dinner, WiFi access, snorkeling equipment and kayaks, to be paid upon check in at the resort. This renovated dormitory offers access to modern shared bathroom facilities. There are 4 single beds. A mandatory resort package, including breakfast, lunch and dinner, WiFi access, snorkeling equipment and kayaks, to be paid upon check in at the resort. No alternative dining options are available. Located alongside the beach, this older-style traditional dormitory offers either sunrise or sunset views and sleeps 4 guests in bunk bed style accommodations. Includes access to shared bathroom facilities. As members of The International Ecotourism Society, we take responsible tourism seriously and we're constantly looking for ways to minimise our ecological footprint, protect the natural environment and contribute to the wellbeing of the villagers. House Rules Barefoot Manta takes special requests – add in the next step! All children under 12 years are charged FJD 114 per night for extra beds. Any additional older children or adults are charged FJD 114 per night for extra beds. Barefoot Manta accepts these cards and reserves the right to temporarily hold an amount prior to arrival. Please note that there is a 3.5% charge when you pay with a credit card. Please note that beach towels are not included in the price. You must bring your own. Please inform Barefoot Manta of your expected arrival time in advance. You can use the Special Requests box when booking, or contact the property directly using the contact details in your confirmation. 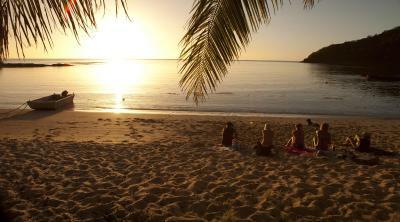 Resort has 3 beaches, on sunrise beach the best snorkeling ever in Fiji, big territory. Had a lovely few days on the island. The staff were really friendly and welcoming. The food options were amazing, we didn't have a single bad meal. The bed was comfy and the rooms are all right on the beach. Every thing was perfect.when you come to the island you need pay 105FJD/per night(include all meals and activitics except snorkeling with manta,it need pay 65fjd one person).Good staff,excellent fiji night in saturday(traditional food lovo for free),service,snorkeling environment(a lot of colorful corals and sharks!starry sky even better than i saw in Lake Tekapo NZ),Actually because of no manta season and almost maybe twice a day you experience rain shower,but just 30 minutes ,so not a lot of people in here,i chose one 4 beds room but just 2 people include me.By the way, my roommate was very hansome.☺The most wonderful thing is i saw a huge manta!maybe 3 manta,this is the first time it has come here this year.so lucky!Next year,i try to come back.Thank you! friendly staff ! great sining group ! Fantastic - great snorkeling off sunrise beach, although a tourist destination it seemed very like living with locals and they are very caring of their guests. This is not high resort living, it is local living with real people who care and do their best for you. One of the best places during my island hopping! I spent 2 nights on Barefoot Manta and was positively surprised. I arrived on a Saturday and didn't know they would have a 'Fijian' night including a kava ceremony, lovo for dinner and afterwards some singing and dancing. The atmoshere and staff were so warm and friendly, always smiling and chatting with their guests. The accomodation itself was lovely and you could see the sea and the beach out of your bed. There are 3 different beaches around the resort so it's pretty quiet and not crowded. 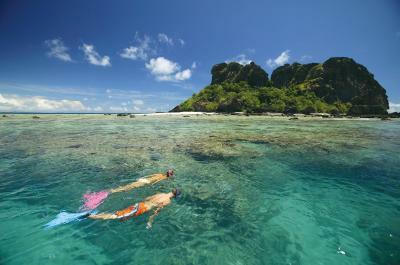 It's the perfect place for snorkeling as it has a colourful variety of fishes as well as corals. The food was good and you always had a choice of 3 different dishes for lunch and dinner (dinner included 3 courses). All in all, I had a wonderful stay there and would definitely go back to Barefoot Manta. We stayed in the Bure with shared bathroom. For some reason these are really old compared to the dorms and private bathroom bures which appear brand new. Although not much of a problem as we didn’t spend much time in the room they were in really poor condition. The windows were held open by planks of wood which always dislodged and slammed on my fingers a few times. There was no mosquito nets on windows which I noticed there were on the dorm rooms. The door didn’t have a proper lock - just an old rusty handle. And the fan was really old and not much use which made the room unbearably hot at night. Given that the rooms were reasonably priced overall we really liked our stay, but it is really frustrating knowing that people who paid much less for a dorm got a much better/newer room with safe doors/mosquito nets/working fans. If I was to stay again I would most definitely take the cheaper option. Fantastic location. Amazing coral and snorkelling. Quiet which meant had beaches to ourselves most days. Ran out of loo roll in the loos on the last day but that is literally the only thing!! 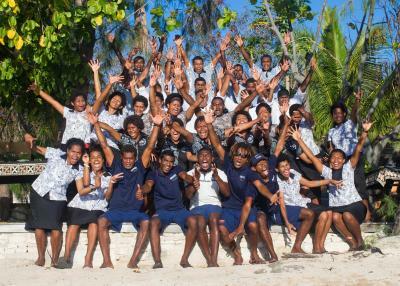 Amazing dive and resort staff. Skye, Jared and Rob were really awesome and Tumax and the ladies at reception were so friendly and extremely helpful. The dive sites were awesome and they made doing my SSI course stress free and fun. The sunset boat trip was free and good fun as well. The far end of the beach was littered with plastic rubbish. Not cleaned probably because it’s not the “tourist” part of the island. The dorm (#1) we stayed in was close to amenities and windows had mosquito screens as well as mosquito nets. The rooms were made up and cleaned daily by Margie who had a bright smile and was lovely to chat with. You can tell the staff were genuinely friendly and looked happy in their jobs. Saki, who looked after guest relations, was a dignified gentleman. He made our stay pleasant and enjoyable. The other staff were welcoming and invited us to watch rugby sevens on their TV. It was thrilling to watch Fiji’s matches and hear the cheering! The reef was beautiful and SO accessible. The water was clean and crystal clear. I saw a sting ray, loads of small and medium sized fish, colourful coral - and this was by walking around the edges of the reef at low tide. Snorkellers saw even more, including reef sharks. Other things that were great - having self-serve water, the Fijian traditional activities and lovo night, sunset cruise around the island, research lab where there are displays of sea creatures and coral, easy hiking trail to lookout points over the island (for sunset as well as sunrise). Loved everything, was exactly what we were wanting, the experience the people everything! The whole staff team werw very welcoming! It was defiantly sad to leave after our 3 nights stay! If your planning your holiday skip the main land and come straight to the island you won’t regret it! Everything is great but lunch is mainly a main dish (or a buffet) it would be nice and wouldn’t cost the resort too much to have at least a fruit with it. We had a great stay The staff is lovely and makes your time on the island perfect. 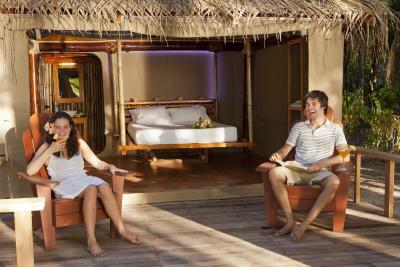 We had a traditional bure on sunrise beach and it was really nice and comfy. 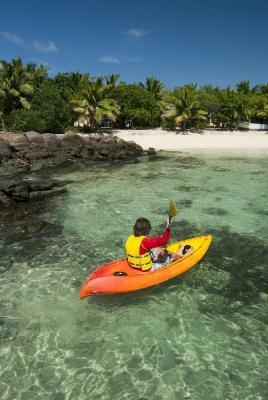 3 beaches to choose from, great snorkelling and free kayak available as well. We did the Marine tour and it is great on info about the reef and corals. Food was nice but lunch is a bit light for what you pay. Breakfast has lots of options though! All in all we are very happy with our stay. Gutted that I only stayed for a night. Food was OK.
Everything! Staff were really friendly. No ceiling fans in the main common space, so it got very hot there. The location of accommodation was next to the beach. The coral and fish variety for snorkeling was exceptional. The water was drinkable and tasty. The staff were genuinely concerned for your comfort and happiness. There was a mix of excursions, paid and unpaid. The vibe was authentic. Not a loud party resort. Really suitable for a relaxing, rejuvenating stay in the sun.